ABOVE: Workers repair a building foundation while a canal is drained for maintenance. More pictures: For a photo essay, click here. That pretty much sums up the challenges facing the Venice public-works department. In most cities, repairing the streets is a straightforward process of tearing up the old pavement, grading the surface, and covering a base of dirt, gravel, or crushed rock with a fresh layer of concrete or asphalt. In Venice, however, the streets consist largely of canals--and before the streets can be repaired, somebody has to get rid of the water. The first step in canal maintenance is to erect one or more cofferdams. 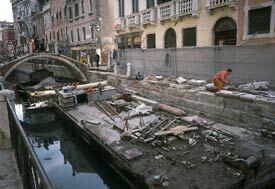 These temporary walls seal off the canal from adjacent waterways such as the Grand Canal or the Venetian Lagoon. Once the cofferdams are in place, the work crew uses pumps to drain the canal. Then comes the hard part: removing the thick, charcoal-grey layer of silt and sludge that may have accumulated over several decades. At the dredging site, a canal worker uses a small dragline (i.e., a duty-cycle crane) to dig up the sludge and transfer it into a wheeled vehicle with a tilting hopper. Each time the hopper fills up, the vehicle's driver backs along temporary rails until he reaches a barge. He tips the muck into the barge, then returns to the waiting dragline. This process is repeated hour after hour, day after day, until the canal is ready to be flooded and reopened. Shovels are also used when needed, to clean out whatever the dragline leaves behind. Ancient pilings. Venice's palaces, churches, and other buildings are supported by thousands of wooden pilings that date back hundreds of years. As long as they're submerged, the pilings won't rot--but when they come in contact with the air, deterioration begins. This requires that exposed wooden pilings be protected during the cleaning of the canal. Public utilities. Today's Venice has water mains, electric power lines, fiber-optic cables, and other utilities, just like any other city. Work crews must be careful to secure exposed utility lines and avoid damaging them while cleaning out the canals. "Far down in the gulley of the empty waterway, beneath the ornate doorways and marble steps of the palaces, you may see the labourers toiling in the sludge....Their bodies, their clothes, their faces are all smeared with the stuff, and if you engage them in conversation their attitude is one of numbed but still mordant resignation." As the saying goes, "It's a tough job, but someone's got to do it." That's reason enough to drink a toast of thanks to the canal workers of Venice as you sip Prosecco on your next gondola ride.